Very interesting and informative thread, thanks for all your efforts everyone. Last I knew this was not known as being possible. Good work! Have you ever had problem with new born grubs getting out your bins? Just recently a few larvae did climb out. I had the bin in the sun with the cover on creating condensation on bin walls from high humidity and the rearing tub was up against the wall of the bin allowing the larvae exiting the tub to crawl directly onto the wall instead of falling to the bin bottom. The bin is completely inside a bag of netting which is also secured around the top rim of the bin with a collar of split foam pipe insulation and bungee cord. I had thought that netting being secured in this way would keep the BSFL inside the bin but not so. Most were kept inside the 'bag' but I did find one on the floor beneath the bin. The 'bag' is basically a tube 152cm in length with open ends and a stapled fold-over seam. Both open ends are rolled up and secured. A short zipper across the top of the bin provides access. There are no obvious holes in netting so I'm not sure how the larvae found on the floor got out. While I had the netting opened to retrieve an errant larvae it gave a good view of pupa which have collected against the end of the bin. The concept of using small animal bedding overtop of potting soil was to simulate leaf litter on the ground. I don't know how valid that is but the larvae seem to burrow down to the bedding/soil interface to pupate. Pupae and old pupal cases (puparia) left after the flies emerge (eclose). The rearing tub with egg trap and water container are visible in the background. The wire on the left side is for the temperature probe in the rearing tub. The BSFL are indeed proving to be escape artists. A few have even found a way out of the netting bag possibly through the stapled fold-over seam. In an effort to prevent further escapees this seam was folded over a second time and stapled again on a tighter spacing. My bin was built with an electric fence but it had never been used until now. My use of metal tape was inspired by a worm fence developed by Tarvus as shown in his video (link) and which I tested on BSFL (link). The fence is on the inside of the bin just below the rim and consists of two narrow strips of conductive aluminum tape separated by a small gap. The tape strips are connected to a small 9 volt battery so that any larva which touches both strips at once completes a circuit receiving a non-lethal shock. The power leads were extended outside of the netting bag passing through the zippered opening alongside the wire for the temperature probe. The battery was secured to the outside of the bin under the bungee cord. Battery voltage has remained steady at 9.15VDC so there is no evidence of partial shorting due to the high humidity in the bin. So far so good. In the two days since the fence was energized no larvae have been found outside of the bin (in or out of the netting bag) as compared to six found in the two previous days. The originator of that thread that Martin linked to recently posted a video of his process. The captions are in German but it still gives a good illustration of how simple the set up can be. A small update on my project - it's been a year since the bin was started with about 100 larvae and now there are 50+ adults buzzing around as well as an unknown but large number of larvae. The initial rearing tub finally filled with castings (or 'pudding' as Jerry calls it) so it's been replaced. I've moved the full tub into a separate container (ice-cream pail - very hi-tech). As the larvae mature and crawl out to pupate they are trapped in the bottom of the pail and then are manually transferred back to the bin. Once all of the larvae are gone the tub will be emptied and cleaned to be used again. The electric fence grub barrier failed after the foil tape delaminated either from the larvae or the humidity in the bin. 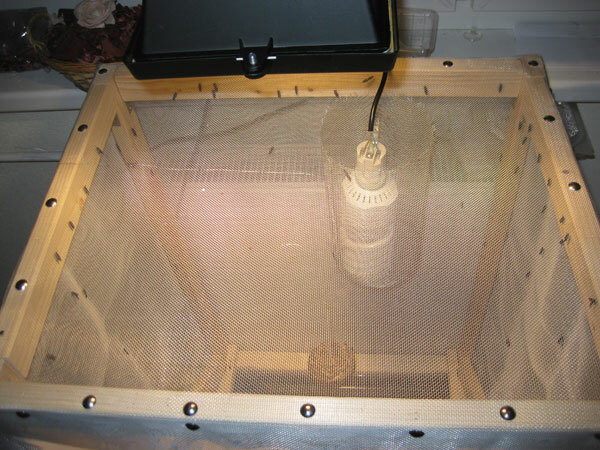 Most of the wandering larvae are trapped by the netting bag which incloses the bin and returning them back to the bin is part of the daily routine. My goal for now is to keep the bin going for as long as possible. My bin population is thriving and the bottom is now covered with a layer of old pupal cases (puparia) left after the flies emerge (eclose) and dead flies. At some point these will have to be cleaned out while keeping the bin in operation. 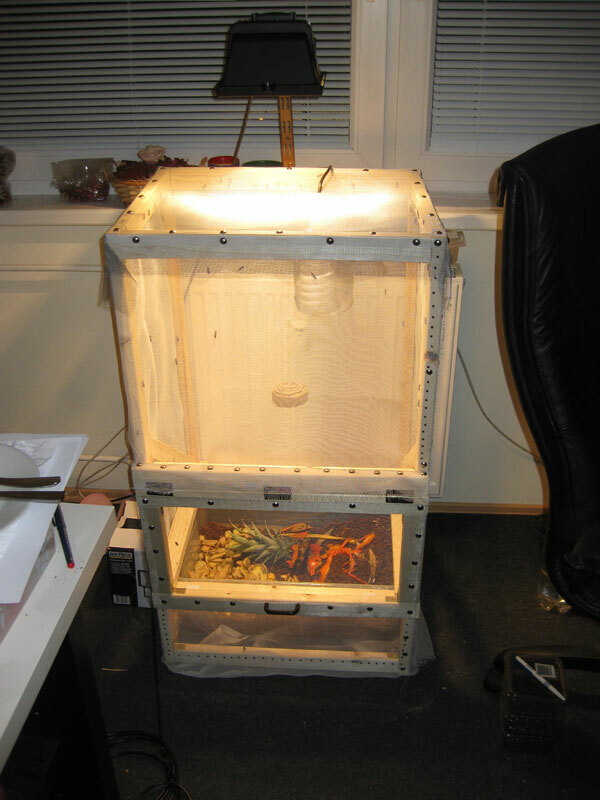 A - Transfer these along with all of the paper bedding including any pupa into a second bin and replace this with new bedding. B - Move the rearing tub and live flies into the second bin with new bedding. Larvae are still maturing in the original rearing tub which was moved to a separate container five weeks ago. These are transferred daily to the new rearing tub in the bin. A small update on my project - The BSF population in the bin continues to do well. Regular operation consists of misting the bin daily to 'water' the adult flies and feeding the larvae every second day. With the return of fall and cooler temperatures bottles of hot water are placed under the bin for supplemental heat. Even with the shorter days the bin is still in sunshine a couple of hours most mornings so the lights are not required for now. Some larvae have taken up residence in my indoor worm bin. They probably hitched a ride unseen in some water that I had used to rinse the filter cloth filter drain of the original rearing tub. This rinse water was then put on the bedding in my worm bin. I rarely see any larvae but have captured about 60 adult BSF over the past two weeks. Luckily the worm bin was already kept inside a netting bag for control of fungus gnats so it keeps the BSF captive too. These BSF are transferred to the BSF bin as they appear and I'm hoping that none will be able to mate in the worm bin. Has anyone experimented with LED lighting in a breeding set-up? Is the lack of heat from the LEDs, compared to other lights, a negative? I am assuming blue is the best choice of color, as it is a warmer color temperature. Is this thinking correct? EDIT: http://www.htgsupply.com/Product-LED-Sp ... ---ONE.asp This is the light I'm thinking about using. Has anyone experimented with LED lighting in a breeding set-up? Here's one (link) but it was not successful. Is the lack of heat from the LEDs, compared to other lights, a negative? I am assuming blue is the best choice of color, as it is a warmer color temperature. Is this thinking correct? I think it probably is although I've had success with the 'warmer' softwhite CFL bulbs. Finally welcome to our forum If you'd like you can introduce yourself here (link). Also if you have a wild population of BSF we would love to have a photo from your location to add to our BSF locator map. See the 'Range and Identification' section (link) for instructions. Thanks for the welcome! Expect a lot of participation from me as my project moves forward. I am excited to draw off the expertise and experience of the people here. I see you're located in Alberta; residing in Michigan myself, I'm sure I have a lot to learn from you in regards to cold weather BSFL composting. As 2012 draws to a close my little indoor colony is doing well (link). At the beginning of January the second generation of larvae were in various stages of development and a few adult flies had emerged (eclosed). Although it's hard to be sure of the exact number, several more generations were produced over the last 12 months. The number of larvae and flies fluctuates but has never dropped to zero so the generations overlap without distinct boundaries. Are there any updates from anyone else raising BSF indoors? Cage: 45x55x90cm (depht,width,height) made from wooden sticks, sides covered by plastic net, top covered by steel wire grid (halogen reflector radiates a﻿ lot of heat). Lighting: cheap 400w halogen r7s flood reflector (manufacturer: cixi guotai), mounted 30cm above steel grid. Turned on for 3-4 hours/day during mating. I think this is another person who started out raising BSFL as feeders for their pet reptiles. SoCo welcome to our forum If you'd like you can introduce yourself here (link). Also if you have a wild population of BSF we would love to have a photo from your location to add to our BSF Mapping Project. See the 'Range and Identification' section (link) for instructions. I was going to embed that image but it's huge Is the spiral like object towards the top a Compact Fluorescent Light? SoCo, do you mind if resize your photo and upload it to the forum? The huge thing is 46W fluorescent bulb, but it wasn't enough. Any idea of the lumens and light color? We've been calling them 'egg traps' for want of a better term. It's thought that they're better off down closer to the food and mounted on the wall or a stake so the hatchlings have an easy path to the food. They're actually a research tool used to determine ovipositing (egg laying) rates and aren't required if there are other suitable places in the bin. However I have seen another system with platforms suspended at various levels below the light to let the flies select the light level (and possibly the temperature) they prefer.